I am writing this blog while being ashamed of myself, I left Tora Investigative [jail] on my insistence and nagging because I could not take the difficult circumstances of the appeal detention, the darkness, the filth, the cockroaches that crawl over my body day and night, there is no break and we don't see the sun, darkness again, but the issue that bothered me most was the toilet, I don't know how to handle the filth of the toilets and the absence of doors and stayed five days fasting, binded binded binded. I was confounded by Nawarah (Negm)'s article in which she spoke of my manliness, but Naglaa Budeir's article reminded me of my previous detention where the blog was my refuge and where I was honest with myself. I didn't know how to man-up and take (the conditions), even though thousands are bearing such conditions and worse, even though I haven't experienced the agonies of a military jail and wasn't tortured like other colleagues of military trials. I have let down my colleagues of the Maspero (incident) detention and that of the Ministry of Defense along with other politicians, I have let down the convicts who were moved by the commotion that was created for me and decided to tell me about the atrocities of the Interior (Ministry) so I can tell the people, they were happy that someone could tell of the baltagiya (thugs) and the organized gangs, and yet I fled for the toilets. I have exchanged the youthful company of the convicts that was filled with happiness & joy with that of the (ones accused of embezzling) public funds that is full of geezers, depression and boredom. During the appeal (prison time) I was daily discovering stories of those who were wronged and (other) important cases, the low ranked police officers who were detained after their first protest and were accused of burning the ministry. I didn't believe that there was something genuine amongst their ranks until I had met them. Tamer Rashwan, whose case is very ambiguous makes us doubt that the State Security is developing new discreet tools instead of detention, torture and neglect that I have witnessed in front of my eyes that I was memorizing so I can tell you about them when I get out. It's not the convicts only who felt that I can play a role from the inside, the detectives were also harassing and inspecting whoever was conversing with me and the large number of informants and all what I said found its way to the administration. I left all that for a more spacious, cleaner and brighter cell, and because I couldn't man up and withstand the toilets of the appeal (prison). This is my capability, these are my limits and this is my weakness. Even the decision of rejecting being investigated in front of a military prosecution that you are celebrating has an element of cowardice, the day we gathered to take the decision I did not have any courage to listen to (my wife) Manal's opinion whom I will leave alone in the last days of her pregnancy and will leave her alone to oversee the workers who are preparing Khaled's room, I who shall be detained and she who shall be burdened while she is running around for my demands, my sustenance and my visitation permits as well as the campaign that was founded for my case. I took the decision in a meeting with colleagues from the revolution and got her stuck and didn't listen to my wife and depended only on the certainty that she will back me up in all my choices. And yet I am proud, it's true I am not the macho that Nawara (Negm) thinks I am but I am not a coward either, I was offered by an important person from the revolution a plea that allows me a swift exit, get out but refrain from insulting the General (Tantawi), only that, a small sacrifice was asked but I rejected it, how would I have faced my family if I had accepted? Let's begin from the start: How are you? 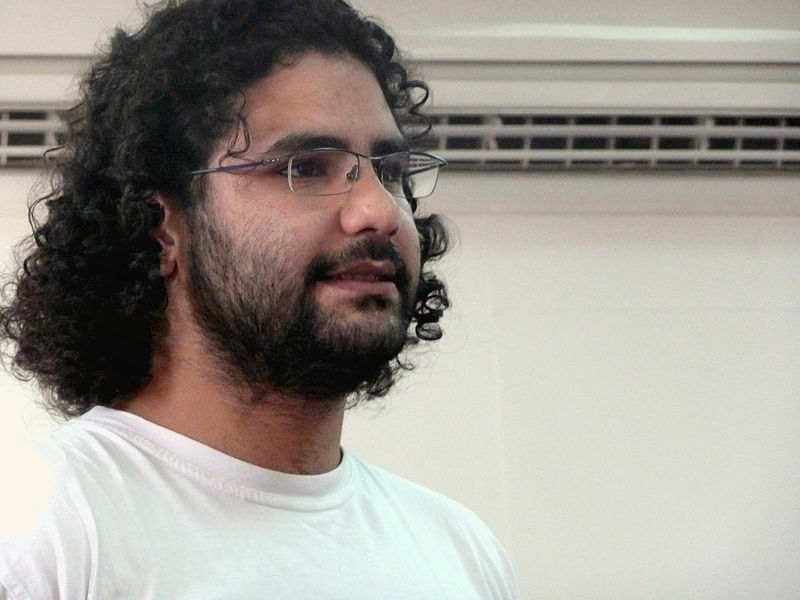 I am Alaa, a foot soldier in the revolution, there are those who sacrificed more than me, those who are much more courageous than me, and those whose role is much more important than mine. I am Alaa, proud that I am doing what I can and sometimes surprise myself with what I am capable of. And I know myself and what I am not capable of. I try never to fail my commitments, I try to overcome fear always and I constantly try to be in the front lines at all times. If you see in me any magnanimity, courage or bravery know that I draw them from my mom, my younger sisters and my wife (who being separated from is the hardest part of detention).